Looks like AUCA has its own Banksy, its own anonymous street artist whose motivation might be to provoke thought and conversation as a means to cultivating a persona. Maybe it’s Dope, the Bishkek street artist turned graphic designer who is also known as Denis Kapkanets. Kapkanets helped Bishkek’s street art evolve from spray painted tags to stenciled koans and inscrutable images that he and two cohorts spread around Bishkek on early Sunday mornings before the city woke up. This Think light bulb is stenciled onto the landing of one of the university’s staircases. 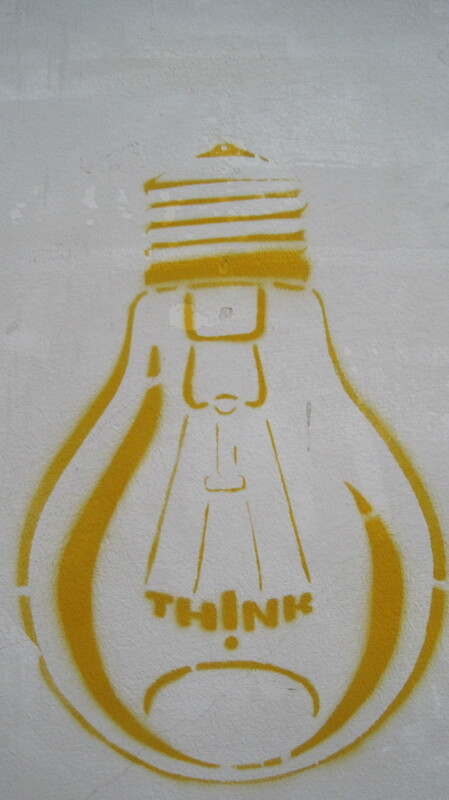 When a student journalist quizzed the department in charge of building maintenance as to why the light bulb had not been painted over, a worker broke through official demeanor and scripted sound bite-speak and admitted an ambivalence about the work and a reluctance to take sides in street art vs. vandalism polemics. Hmm. Sounds like this piece of stencil art made someone think.